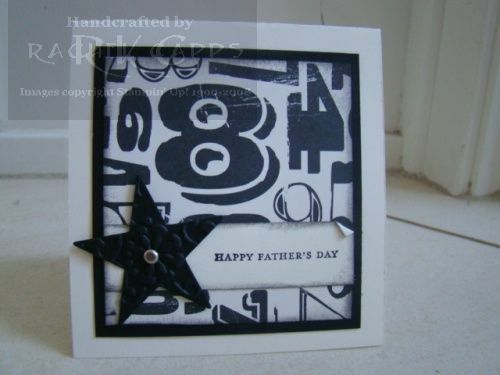 This card was made with the Newsprint DSP (I love it!) and was entirely inspired by Jen Sannes here. Thank you for a stunning card, Jen! 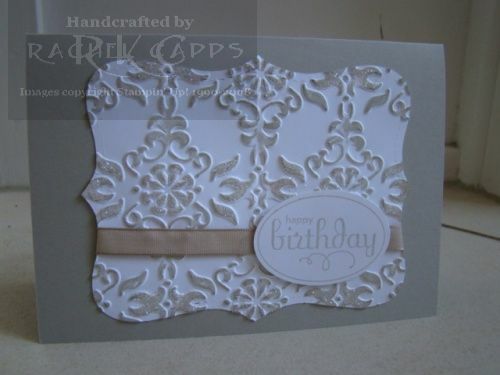 The cardstock colours are Very Vanilla and Basic Black. And the Star was punched from Basic Black cardstock that had been through the Big Shot with the Vintage Wallpaper Embossing Folder. A silver brad attached the star to the card and on the strip of Very Vanilla the sentiment is stamped from the stamp set Teeny Tiny Sentiments. This card was also an inspired card. This time I was inspired by My Sweet Stampin Spot here. I’ve used the colours Sahara Sand and Whisper White. Using the Big Shot, I cut out the Top Note in Whisper White, then ran it through with the Vintage Wallpaper Embossing Folder. I then used my brayer and Sahara Sand ink to roll over the top of the embossed image – and wow! The ink rolls onto the embossed image. Very cool effect, heh? We then stamped the sentiment from Perfect Punches, and punched it out with the coordinating punch. This card was inspired from my trip to Convention in Sydney this year. I’ve used the colours Certainly Celery, Rich Razzleberry, Pink Pirouette and More Mustard – oh, and the strings are my Bashful Blue marker pen. 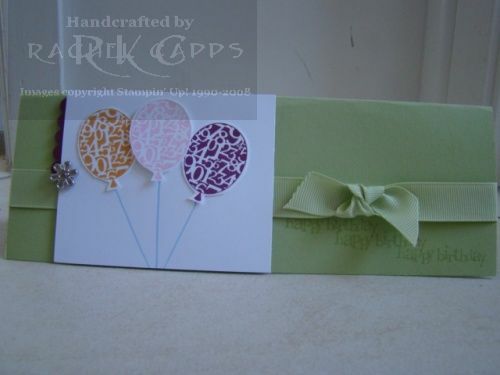 It’s using the stamp set Party Hearty, which I just love – it’s so versatile, especially for kid’s birthdays. Here is a close up with the silver flower and grosgrain ribbon. Next is my daughter so wanting to be part of the night instead of going to bed! 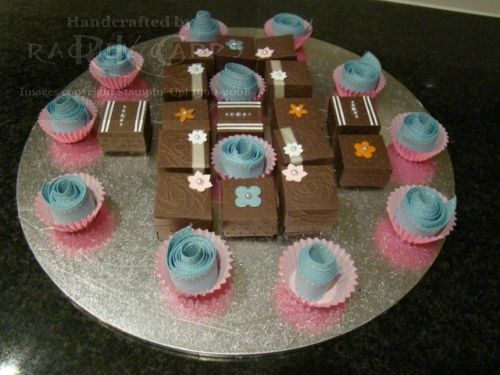 Each guest received a little cupcake of Baja Breeze ribbon and a “brownie” box of goodies. 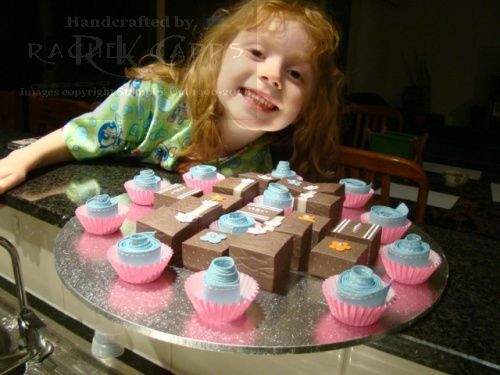 Aren’t the “brownie” boxes the cutest ever? 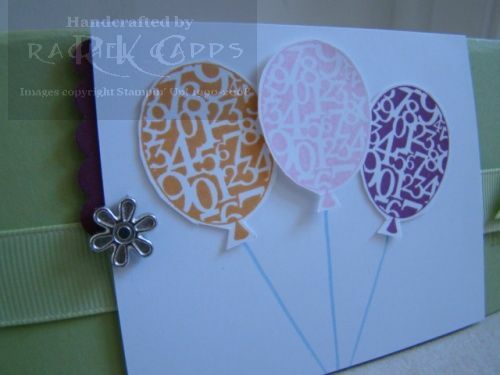 I saw them as a fan of Stampin’ Up! on Facebook here. And I found an great tutorial for the boxes here. 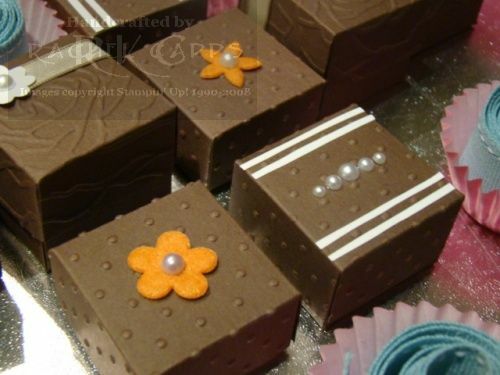 For my boxes, I embossed the brownie boxes with Perfect Polka Dots and Manhattan Flower. Then decorated them with pearls, ribbon, flowers punched from the Boho Blossoms punch and felt flowers.